To be perfectly honest, I have never really been a huge scotch egg fan! I suppose they just take me back to beach pic nics in the 1970’s where there was always a sun warmed, slightly sweaty scotch egg rolling around in the bottom of a Tupperware box at the end of the day. Usually, with a liberal amount of sand stuck to it! But my Mum, who is also following the WW plan, has been seeing Weight Watcher friendly scotch eggs pop up all over social media recently and nagged me into having a go at making some. So, here they are …. and do you know what? I am now a scotch egg convert! They are filling, tasty and although they may be a little fiddly to make, they do make the best Weight Watchers lunch. I had two the other day with some salad and I was stuffed! They really kept me satisfied for hours and hours. Next time I will just stick to the one scotch egg for lunch! That’s plenty. Eat them for brunch, lunch, dinner or even just as a low Smart Point snack! To make softer boiled eggs like the ones in the photo at the top of the page, place the eggs in a saucepan with just enough cold water to cover them. Bring the pan of water to the boil then immediately reduce it to a simmer. Simmer for 3 – 4 minutes before taking the pot off the heat and running cold water over the eggs to stop them cooking any further. Peel the eggs carefully as they are delicate when softer boiled! If you like your egg yolks a little firmer, simmer them for up to 6 minutes. Remember that the eggs will be placed in the oven later on in the recipe so the yolks will cook a bit more then. Place the ground turkey, mustard, parsley and salt and pepper in a bowl (picture 1) and mix with a fork to combine. Pour the whisked egg into a small bowl. Place the flour on to one plate and the breadcrumbs on to another (picture 2). Divide the turkey meat mixture into 5 balls. Lightly dust the work surface with a little of the flour. Use you fingers to squidge the ball of turkey mince into a circle. Roll the first egg in flour and tap off any excess. Place the egg in the middle of the turkey meat circle (picture 3) and wrap the meat around the egg. If the turkey meat is too sticky to handle, dust with a little of the flour. Repeat with the rest of the turkey meat balls and eggs. Roll each of the turkey meat encased eggs in flour (picture 4). Dip the turkey meat encased egg in the whisked egg before rolling it in the breadcrumbs (picture 5). Repeat with the rest of the eggs. Place in the fridge to chill for 10 – 15 minutes whilst the oven heats up. Remove the eggs from the fridge. Heat the oil in a good quality non stick frying pan. Fry the scotch eggs for a few minutes (turning often) until they have begun to turn a golden brown. You may need to fry the scotch eggs in batches, depending on the size of your pan (picture 6). Remove from the frying pan / skillet and place them on a baking tray. I line my baking tray with a Silpat Non Stick Silicone Baking Mat (picture 7) to prevent them sticking. Bake for 10 – 12 minutes on the middle shelf of the oven. Turn half way through. Once cooked the Scotch Eggs should be golden and crispy on the outside and the egg yolks should still have a little softness (picture 8). How long do Scotch Eggs Keep? Cooked Scotch Eggs keep in the fridge for 3 or 4 days in an appropriate container, lined with a sheet of kitchen paper. If kept in the fridge, I would suggest popping the scotch eggs into a warm oven for 4 or 5 minutes to crisp up before serving. Can you Freeze Scotch Eggs? I haven’t attempted to freeze these scotch eggs. However, I will try over the coming weeks and update this post if I am successful! 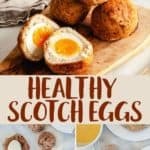 Are Scotch Eggs eaten Hot or Cold? 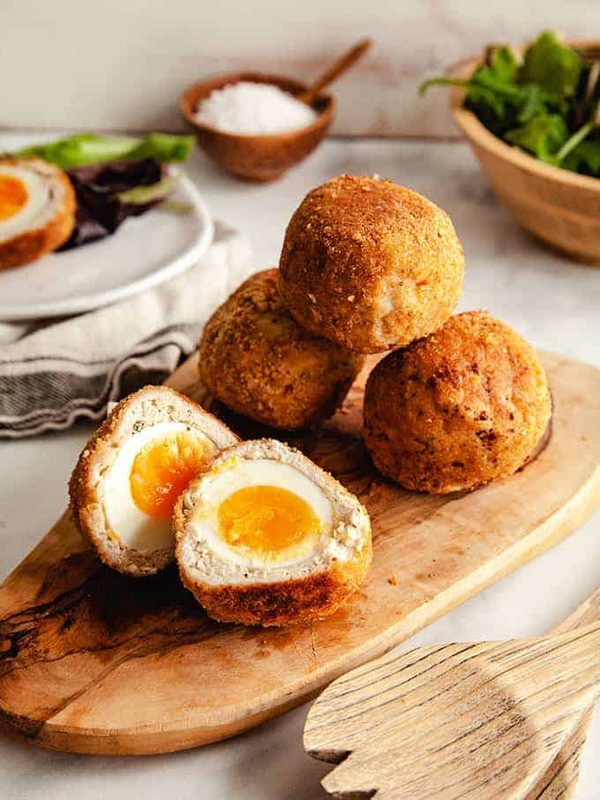 Scotch Eggs are traditionally eaten cold (they are a very popular pic nic food). Having said that I do love to eat these scotch eggs straight out of the oven. Can I microwave a scotch egg? 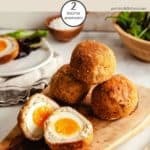 I wouldn’t suggest that you microwave these scotch eggs! 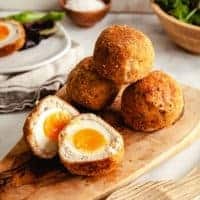 What breadcrumbs should I use for Scotch Eggs? I made my own breadcrumbs for these Scotch Eggs by toasting a Warburton Thin and then blitzing in my NutriBullet! One thin is 3 Smart Points. Dijon Mustard or English Mustard? I use Dijon mustard in this recipe, however you could also use English Mustard. I would suggest that you use a strongish mustard for this recipe as ground turkey can be a little tasteless without a bit of added flavour. If you want more information about different varieties of mustards, take a look at this Mustard Manual from Serious Eats. Can I use Spray Oil rather than Vegetable oil? By all means swap the vegetable oil for calorie controlled spray oil, however this will not reduce the Smart Point value of these Scotch Eggs. I used a NutriBullet, available from Amazon, to make my own bread crumbs. Toast a sandwich thin and then blitz it, once cooled to make the breadcrumbs. I used my trusty Le Crueset frying pan to fry the Scotch Eggs before baking them. Although pricey it is by far the best non stick frying pan / skillet that I have owned & I wouldn’t be without it! When baking most foods I use a Silpat Non Stick Silicone Baking Mat to line my baking tray. 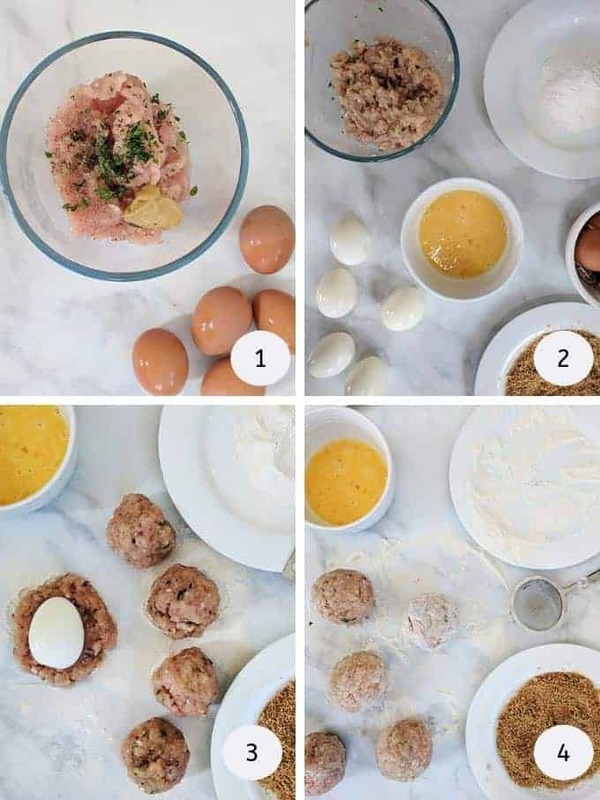 Dip the scotch eggs in fat free Mayonnaise! Or even better dip the scotch eggs in a mix of fat free Mayonnaise and mustard! Serve with salad and some of this low point Coleslaw. 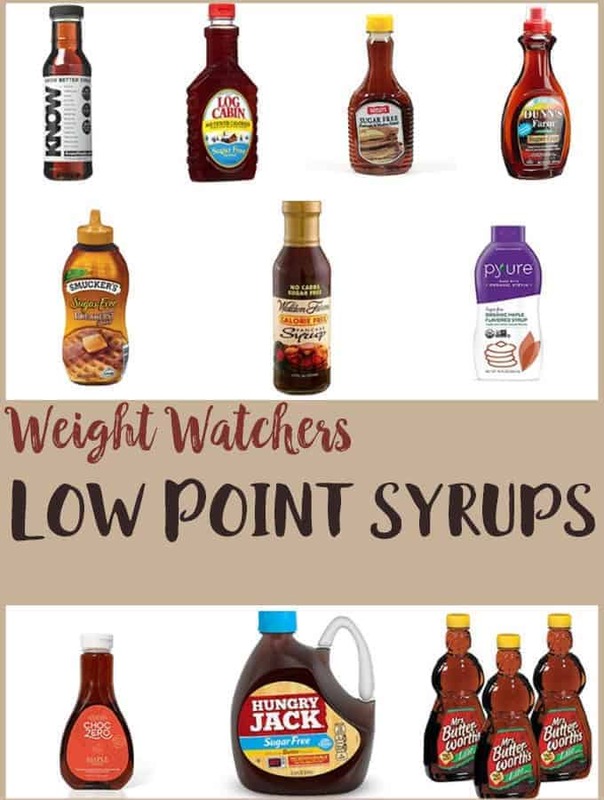 Other Weight Watchers Lunch recipe ideas. If you are looking for other tasty and filling Weight Watchers lunch recipes, you may like these Butternut Squash Falafel. They are zero Smart Points on Weight Watchers Freestyle plan. 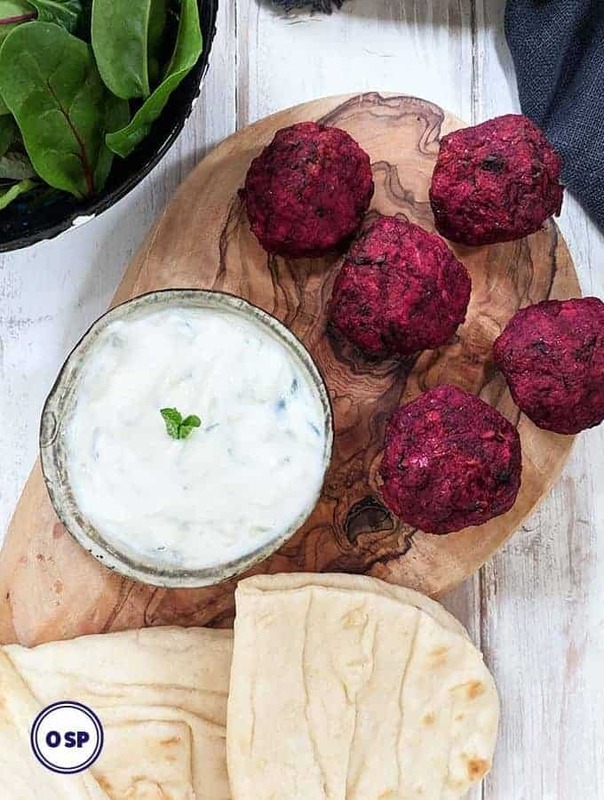 Serve them with pitta bread and some Zero Point Tzatziki for a really delicious and low point meal. You can also find a number of Low Smart Point soups here! 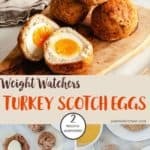 These delicious Scotch Eggs are just 2 Smart Points per portion on Weight Watchers Freestyle plan. Perfect for a low Smart Point lunch. Place 5 eggs in a saucepan with just enough cold water to cover them by 1cm or so. Bring the water to the boil, then reduce to a simmer and cook for 3 - 4 minutes. Remove from the heat and rinse under a cold running water until the eggs are cool. Carefully peel the eggs and set aside. They will be soft so do be careful with them. Whisk the remaining egg into a bowl - this will be used for dipping the eggs. Place the flour in one bowl and the breadcrumbs in another bowl. In a small bowl mix the ground turkey / turkey mince with the chopped parsley and the salt and pepper. Divide the ground turkey into 5 equal portions and roll each portion into a ball. On a lightly floured work surface flatten the first ball of ground turkey into a circle with the tips of your fingers. Roll the first egg in a little flour and then place it in the middle of the circle of ground mince. Wrap the turkey mixture around the egg, using a little more flour to prevent your fingers sticking if necessary. Repeat with the remaining eggs. Roll each of the meat covered eggs in the flour. Dip in the whisked egg and then roll in the breadcrumbs until covered. Place them in the fridge to chill for 15 minutes. Whilst the eggs are in the fridge preheat the oven to 200oC / 180oC Fan / 400oF. Heat the vegetable oil in a frying pan / skillet and lightly fry the eggs over a medium heat for 1 - 2 minutes, turning often until they have started to turn golden (they will continue to brown in the oven). You may need to cook the eggs in batches depending on the size of your pan. 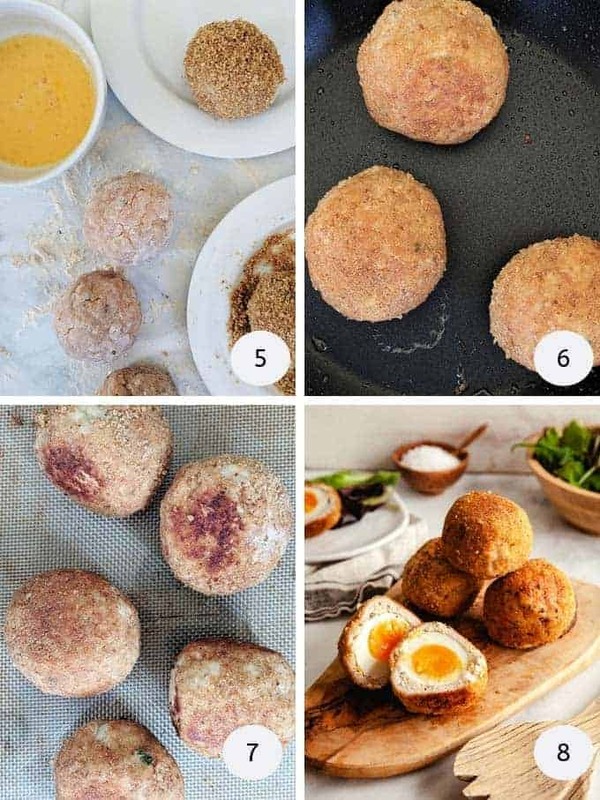 Place the eggs on a baking tray and bake in the middle of the preheated oven for 10 - 12 minutes until the outside of the scotch eggs are crisp and golden brown. 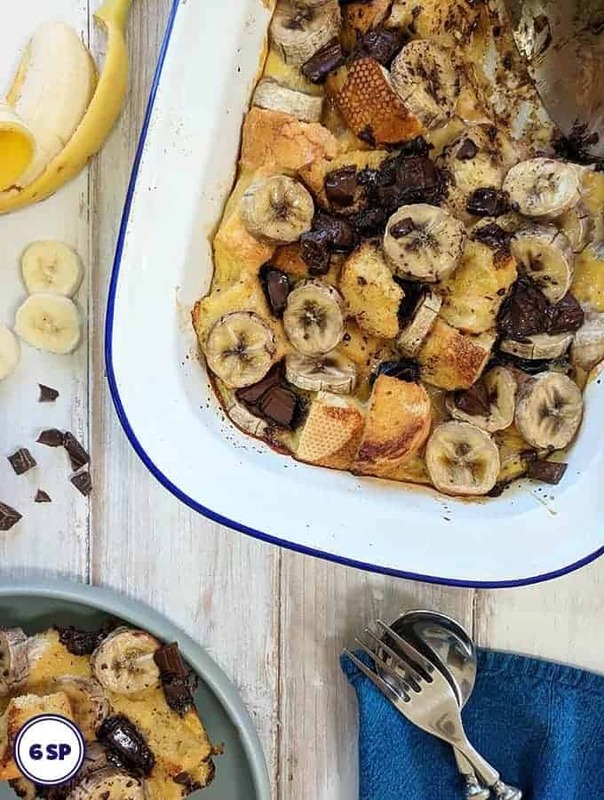 Eat warm from the oven or leave to cool. Serve with salad for a low Point Weight Watchers lunch.